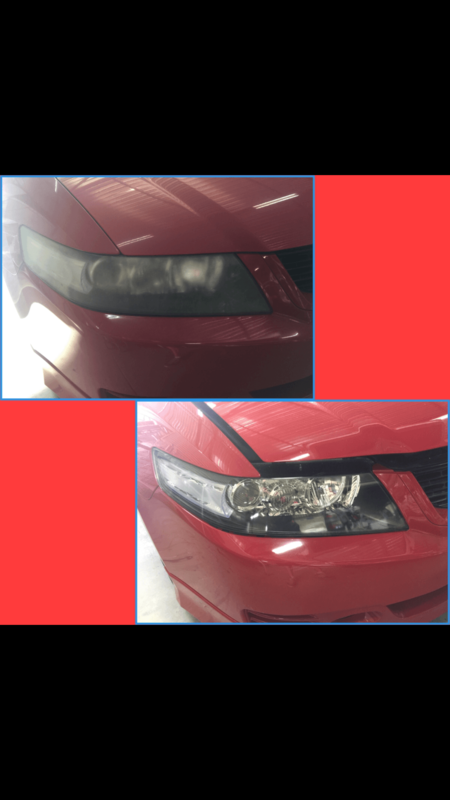 Headlight Restoration service now available………………. Over time plastic headlight covers will become cloudy, dull, faded or scratched, affecting the brightness of the headlights and leaving your vehicle in need of headlight restoration. The Australian climate can play a big part in the discoloration of the headlights. Some of the other causes of damage to headlights is stones flicking up off the road while driving, fine particles of dirt sticking to the cover, applying the wrong cleaning agents, or using abrasive cleaning tools. Clearer lenses equals better visibility on the road. SMART Paintworx now have the most up-to-date headlight restoration kits ready to repair and restore your vehicle’s headlights, at the convenience of your own home or office. Improve the quality of your headlights, or brighten the look of your vehicle by having SMART Paintworx restore the covers back to looking as good as new, or as close to it as possible. Using our new headlight restoration tools and products we can repair the fading, scratches, dullness and discoloration that are unnecessary. Headlight restoration can be completed during your lunch hour, at your home or office by one of our SMART Paintworx Mobile Technicians. This entry was posted in headlight restoration and tagged headlight restoration. Bookmark the permalink.